1. How do I access the Dashboard? When you access your Affiliate Site whilst being logged in with the platform, you will see in the upper left of the screen a black bar on which there are two menus – My Sites, AVFM (Country) and New. Just go with the mouse pointer on where the second menu (without clicking the mouse on AVFM (Country) – and another menu will be opened with the following options: Dashboard, Themes, Customize, Widgets, Menus and Header. Then, just click on Dashboard. 2. How do I translate elements from the main page in the local language? Most of the elements on the main page are defined by the Widgets which are to be found in the Widgets section (which can also be found in Appearance menu in the Dashboard). For instance, if you want to translate the first three sections (News/Bulletins/Hangouts) you need the edit the widgets called home_left, home_middle and home_right. When you open a widget, just edit its title and click „Save”. Click on the image to enlarge. 3. How do I set a featured image? Every single article you will post has to have a featured i mage. To set a featured image, you need to go to the “Featured image” widget when you edit an article (see image). When you post an article that is a translation of an article originally posted on AVFM Main Site, it is recommended (but not mandatory) that you use the same featured image as the original article. Otherwise, you can use an image that AVFM has license to republish it. It is mandatory that AVFM (not just yourself) has publishing rights for a certain picture. If in doubt, ask someone from the senior management. The only exception is when we’re talking about a picture you made yourself or it’s an internet meme – in which case you’re free to publish as long as it doesn’t breach the local law. 4. How do I embed a video? 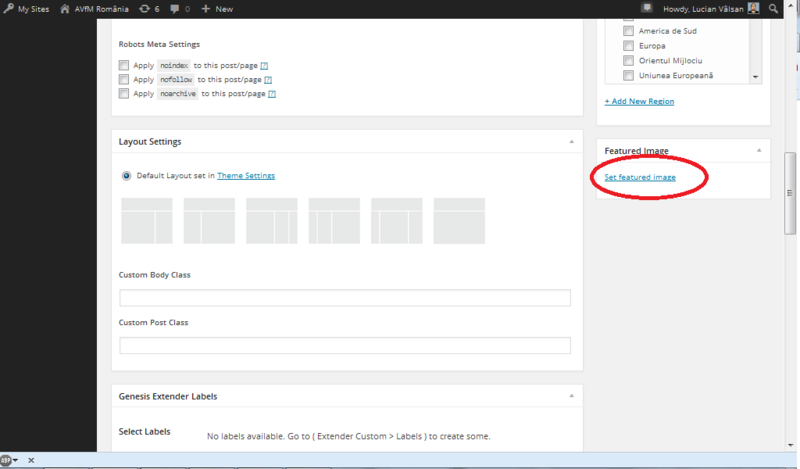 When you are editing an article, you will see right above the body of the text a button called “Add Shortcode”. Click on it and then choose the option Code in the Shortcode category menu and then choose WordPress Shortcode from the Shortcode menu. 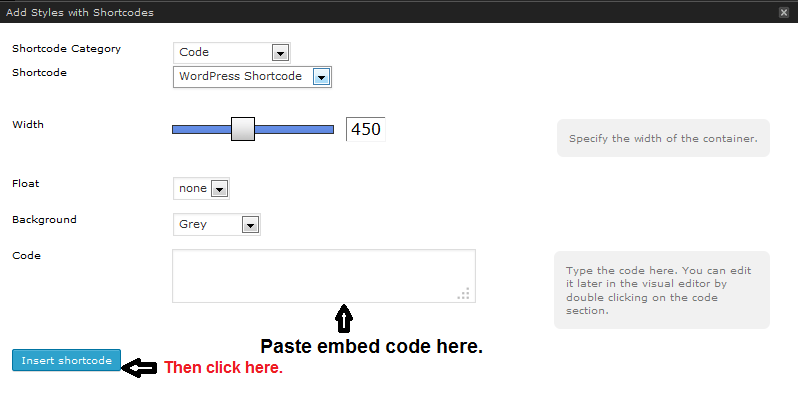 After that, paste the embed code into the Code textbox and adjust the width, if necessary and then click Insert Shortcode. This is an option that works just fine with any embed code (Vimeo, DailyMotion, Youtube, etc.). 5. How do I create a main menu similar with the ones on the Main Site? 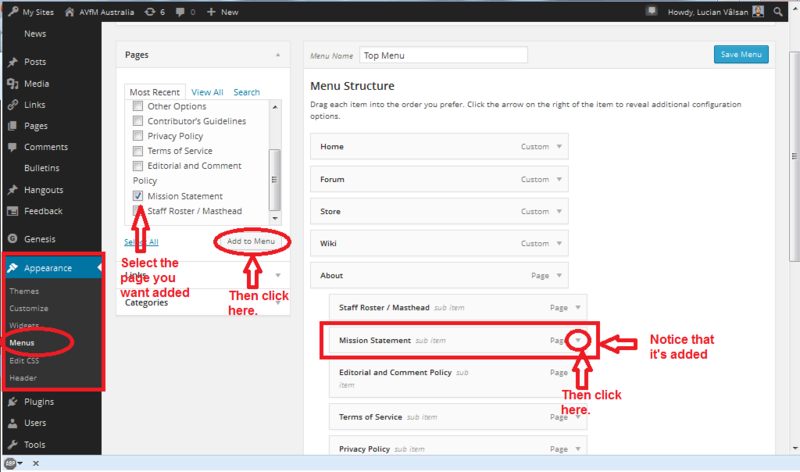 For most of the elements in t he menu, you will need to edit pages. 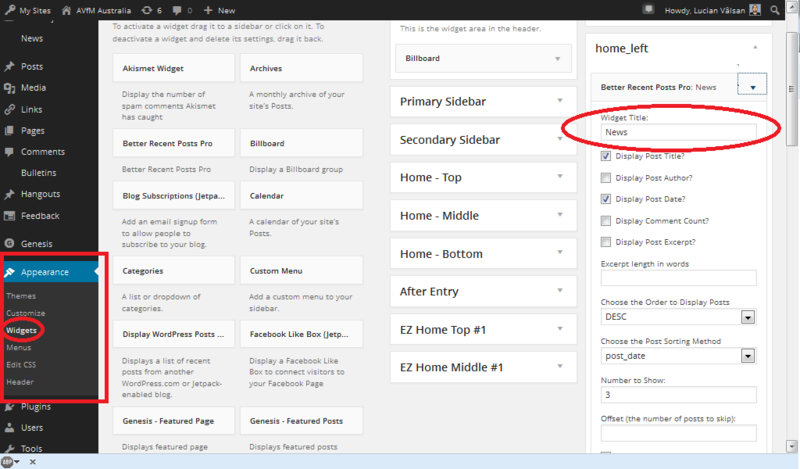 To create a page, go to Pages -> Add New in the Dashboard. Once you published a page, retain its URL for future reference. After that, go to Appearance -> Menus and in the left side you will see all the pages you have created. All you have to do is to just select which one(s) you want to have in the main menu and then click Add to Menu. If you want the newly-introduced element to be a subcategory of another menu, just click on it and select Under X(where X is the closest menu). If you don’t have that option for various reasons use Up One or Down One to move it around until you get the value for X that you need. 6. How do I create sliding articles like on the main page? First need to create a category to control that option. On the main site the category is called featured. On AVFM Italia for instance, it’s called Suggerito. At the end of the day it doesn’t matter how you call it – all it matters is that it has to be a category solely used for this purpose. 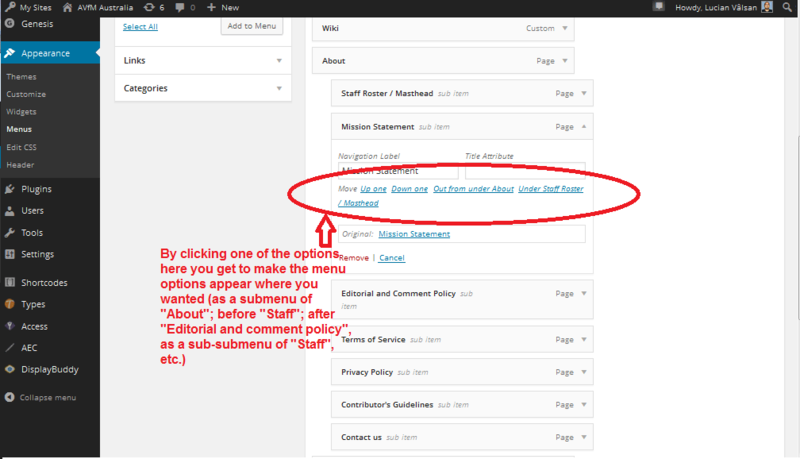 To create a category go to Posts -> Categories in the Dashboard and create a new category and then remember its slug. 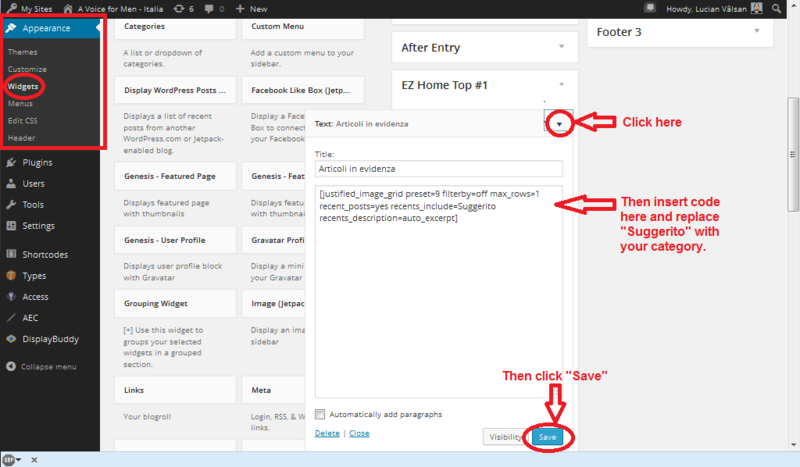 Then, go to Appearanc e -> Widgets and click on the widget called EZ Home Top #1. You will see two elements in that widget: Text and Genesis – Featured Posts. Click on the Text element and there you will see an option to define the title of the feature (which you should translate in your language) and beneath a code. This is the code used on AVFM Italia so please make sure to change the portion where it says Suggerito with the name you gave to the category defined in Step 1. 7. Why can’t I see my newly published article? If you post an article without assigning it a category, the article will be visible on the front page but attempts to hit the article itself will throw a 404 not found error. The reason for this is the way that AVfM does its permalinks, and there is pretty much no way around this – other than assigning it in a category. If for whatever reason, you don’t intend to categorize your posts too much, as opposed to how it is done on the main site, then it is highly recommended that you set a default category in Dashboard -> Settings -> Writing in addition to the category necessary to control the featured articles widget. 8. How do I add a new author on my Affiliate Site? When you add a user with a specific role to your site’s users panel, you typically have to wait for them to acknowledge the invitation by clicking on an emailed link (or else an admin would be able to see anybody’s email address without that user’s permission). In the general case, where you are adding only one or two users at a time, this shouldn’t be anything more than a minor nuisance. The usual procedure is that the person you wish to add creates their account (if they don’t already have one), tell you, you add it in your control panel, and they accept the invitation. For affiliate operators who are translating collections of articles, however, this is more than a nuisance, especially when you don’t otherwise have much interaction with the original author. In these cases, send an e-mail with a list of authors (and their usernames, if you can) that you want added (and which affiliate you’re associated with) to Lucian Vâlsan and those will be added directly (with no confirmation required). 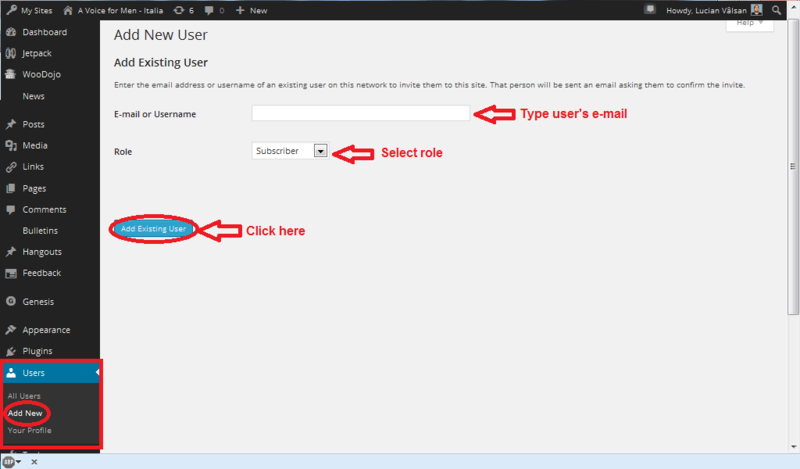 To add an author, go to Dashboard -> Users, insert user’s name, select the user’s role (see next question about what roles are) and click “Add existing user” and wait for the user to acknowledge the invitation sent through e-mail. 9. What roles can a user have on my Affiliate Site an what is the access level of each role? Contributors can write Posts (but not the custom taxa News or Bulletins etc), but not publish or edit once published. Authors can write and publish their own Posts, News and Bulletins, and also edit their own posts once published (but nobody elses). Editors can do the same, but also edit and publish other users’ work. It is possible to adjust these permissions, as well as create new roles (within reason) in Dashboard » Access. AVFM Main Site, for instance, has a custom role called Publishing Editor that is basically the equivalent of a standard Editor with the difference that they can publish whilst Editors cannot. 10. How do I subtitle a clip into my native language so I can publish it on my Affiliate Site? This is something that requires a lot of work. Please read the page dedicated to this topic.